Stock up and show your support for ASCC! One June 23, the Hawthorne Valley Farm store is donating 5% of its sales that day to ASCC. Also on view in the Farm Store café gallery is an exhibit of ASCC’s Art in the Library Program, including accordion books, printmaking and photographs of community participants. ASCC’s Art in the Library program has provided free art programs in libraries and schools for 1000s of community members since 2015. 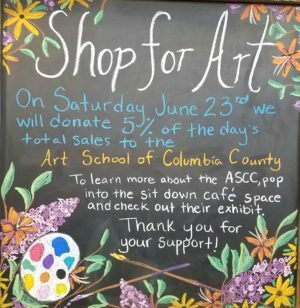 Please stop by the Farm Store on June 23, and pick up a few snacks or stock up – either way, you are showing your support for ASCC and art in our community. Thank you! Hawthorne Valley Farm Store, a full-line organic/natural foods and grocery store, is part of the larger Hawthorne Valley Association, a 501(c)3 nonprofit. The store offers many locally grown or produced fruits, vegetables, grocery products, and household items and is committed to supporting our local farmers and artisans. Learn more at https://store.hawthornevalley.org.